Soaking live mussels in flour water cleans out any remaining grit, plumps up their meat, accentuates the meat’s color to make it more orange, and gives them a more creamy texture. 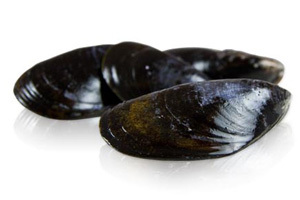 The mussels will eventually drown if left in flour water long enough, so you should only do this a few hours ahead of cooking them. 1. Whisk or blend together the flour and water until there are no lumps. 2. Scrub and de-beard your mussels if necessary. 3. Put the mussels in a deep bowl and cover them with the flour water mixture. 4. Soak in your refrigerator for 1-3hrs. 5. Rinse off the flour-water mixture before cooking the mussels. Tried this method with amazing results! Delicious and sweet; we will forever prepare our mussels this way. Thanks! If you are unable to tolerate flour or find it too difficult to dissolve the lumps in cold water, substitute with corn meal, grits, or semolina to soak mussels or clams in for 1-3hrs and as they open to take in the corn water. it will filter through the inside of their shell removing all the dirt and sand as they “spit” the water and corn meal back out. (Do not re-use the water, obviously.) The texture of the corn tends to be a better filter and scrub for the inside of the shells than AP flour.